Between watching 2-1/2 week old Colman eat at a Herculean level, being back at work, cooking dinner for us when I get home, and "sleeping" (as we call our 2 to 3 hour series of interrupted naps), I hope you'll forgive me for not being in the blogging mood. It doesn't in any way mean we have been suffering from appetite deprivation. What with friends bringing over food to see us through (I'm particularly grateful for a welcome home middle eastern takeout feast from J&K, a super satisfying bolognese sauce from Denise and a few bowls of lovely fresh corn chowder from my sis), Colman's ability to sleep soundly for 2 or so hours at a time allowing us to get our restaurant fix, and my cooking after work, we've actually probably never eaten better. With a ton of things on file ready for my blogging and your consumption, I'll start with one of the easiest and satisfying things we've had. I poached this recipe for smoked paprika butter from Food & Wine Magazine, where after reading through it I was ravenous for a good grilled steak. 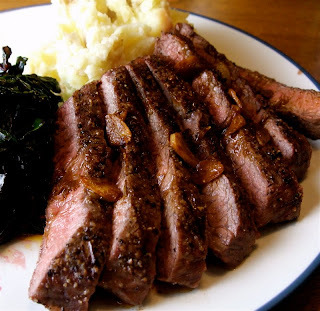 So a few nights ago, after a quick stop at the butchers at Laurelhurst Market where I picked a beautiful piece of flat iron steak, I was set for an evening of beefy bliss. The F&W recipe was for ten people. Maybe that will work when CTB is a teenager, but right now for two it was easy enough to pare down to size. In a small saucepan melt the butter. Add the garlic and cook over low heat, stirring, until golden, about 3 minutes. Add the paprika and cook until fragrant, about 30 seconds. Remove from the heat, stir in the lemon juice, and keep warm until your steaks are done. You can also make ahead and reheat gently when needed. When steaks are ready, spoon paprika butter over and serve immediately. Coma mi espinaca? Por supuesto!! Real men drink Lemon Drops! Portuguese Pork with Clams: the "wow" factor! Salmon Tikka: phat, not fat!